Cast: Josh Hartnett, Scarlett Johansson, Aaron Eckhart, Hilary Swank, Mia Kirshner, Jemima Rooper, Rose McGowan. Directed by Brian de Palma, adapted from James Ellroy's book. Story: Two 1940s LA cops investigate the murder of a young starlet. The Black Dahlia tries so hard to be LA Confidential but doesn't even come close. Like a post-truck armadillo, it's curiously flat. Brian de Palma has had a varied career, from classics such as Carrie, Scarface and The Untouchables, through the occasional crowd-pleaser such as Mission Impossible to the universally condemned Bonfire of the Vanities. After a four year break, he's back at the helm of this James Ellroy adaptation, and it completely fails to live up to Ellroy's previous seminal LA Confidential. It's hard to pinpoint quite why that is - both have intricate stories, star-studded casts and competent production values, yet Confidential was completely gripping from beginning to end, whereas The Black Dahlia just seems to go on and on, adding new twists when we're all packed up and ready to go home. Maybe it's the character development - because of the sheer amount of plot to get through, the characters are launched on us rather than introduced, meaning that we don't have the connection with them that Confidential succeeded in creating. Mind you, that story had masses of plot and still pulled it off, so there's no excuse there. Watered down with a sepia look, the opening feels a lot like last year's vastly underrated Cinderella Man, but from there on it adapts a vaguely surreal posture. Voiced over like an old Sam Spade story and shot like a James Cagney movie, it tries to recapture those bygone classics, but teeters on the edge of unintentional Sin City-style pastiche. If you harbour nostalgia for these old movies then this could be your movie of the year, but for those of us too young to remember Humphrey Bogart the first time round, it just looks stilted and unrealistic. 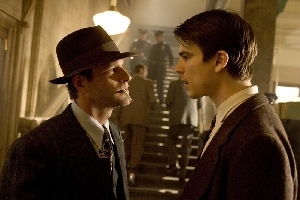 The dialogue, being so pushy and pointed, is rather difficult to listen to, especially from lead man Josh Hartnett. Aaron Eckhart who, I have to admit, I've been rather prejudiced against since the disastrously bad The Core, is far better here and is much more balanced than Hartnett. Scarlett Johansson seems to perch on top of the movie rather than joining in - not that it's a weak performance, it just doesn't assimilate with everyone else's. Hilary Swank (Million Dollar Baby) and Jemima Rooper (Sinchronicity) look very similar in their 40s get-up - I confused them more than once - and yet curiously the script refers to Swank's resemblance to Mia Kirshner (from The L Word), who is completely different. Doh. The Black Dahlia looks excellent on paper, but is merely average in practice. It's like a jumbo burger that contains all the food you really love, but piled on top of each other in a foot-high tower, it just doesn't work. Testosterone Satisfaction Rating: 3/5 - guns, swearing, brief bappage from Mia Kirshner and Jemima Rooper, half of Hilary Swank's arse. Not much adult content. To enjoy this film you should be: into old black and white cop movies. 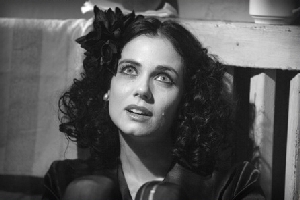 The Black Dahlia was released in the UK on 15th September.